Nate Tatman had no idea how pivotal that moment would be. He’d been in the office of Indiana Ministries when something caught his attention. The map of the state on the wall wasn’t anything new; he remembered seeing it before. But what he hadn’t noticed was the distribution of push pins on the map, which indicated counties that did not have a Church of God congregation. In particular, he noticed this time that there were thirty-seven counties in total with no Church of God congregation. And that’s when things began to get interesting. Five months later, when Stuart Kruse, senior pastor of County Line, did. He’d just returned from a three-month sabbatical over which time he had read the popular Mark Batterson book, Chase the Lion. The book challenges readers to imagine and pursue dreams that can only come to pass by the hand of God. Stu began to quietly wonder how many counties in Indiana don’t have a Church of God congregation. Through prayer, God impressed upon him the notion that a solution could begin with County Line Church. The map Nate saw at Indiana Ministries. Covered in prayer, a strategic plan began to take shape over the months that followed. 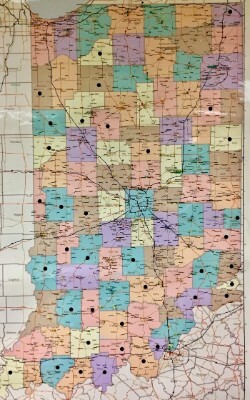 Since Indiana is known as the “Crossroads of America” and there were thirty-seven counties at the time without a Church of God congregation, the initiative became known as Crossroads 37. Ultimately, it was time to gather Indiana churches that wanted to be a part of this effort to sit down and talk. After all, County Line could not go it alone. They needed the resources and support of Indiana Ministries and the input and participation of as many churches as possible. On January 22, representatives came to discuss the possibilities and learn together what God kind of vision for church multiplication God was revealing to the whole. Garrett campus pastor Marcia Weller (platform center) on launch day! County Line had never planted a church before, so the next step was leading by example. 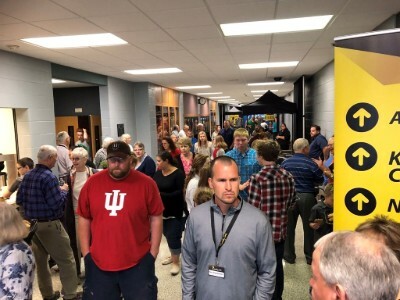 In October of last year, they launched their first campus in Garrett, Indiana, with plans to launch their next campus later this year. Partnerships have been vital to so much stretching and growing: Indiana Ministries, Healthy Growing Churches, and the New Thing Network, for example. At the same time, church multiplication is resonating through County Line and their partnership with Global Strategy, Three Worlds, and the creation of Europe X. 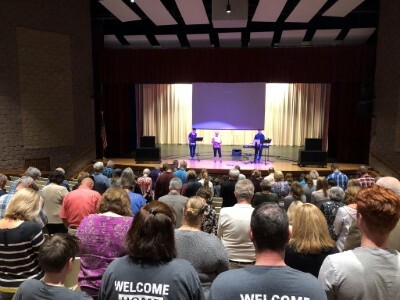 As the initiative continues to take form, Crossroads 37 is recognizing the value of being open to counties that may already have a Church of God congregation, as well as the merit of planting satellite campuses as the Spirit directs. Learn more about Indiana Ministries at www.indianaministries.org. Learn more about the Church of God movement at www.jesusisthesubject.org. This entry was posted in All Church of God, Give Life, Great Lakes and tagged advancement, Auburn, campus church, church multiplication, church planting, County Line Church of God, Crossroads 37, discipleship, Doug Talley, Europe X, evangelism, Garrett, Global Strategy, grassroots, Great Commission, Healthy Growing Churches, IN, Indiana, Indiana Ministries, Marcia Weller, Midwest, mission, missional, multiply, Nate Tatman, Nathan Tatman, satellite campus, Stu Kruse, Stuart Kruse, Three Worlds, vision. Bookmark the permalink.